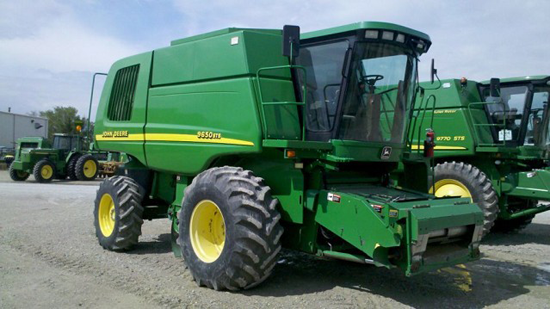 Over the years, many improvements in technology and design were made to John Deere 9000 Series combines. These changes include everything from increased engine power to added grain handling options, and were incorporated to provide farmers with full harvesting capabilities. 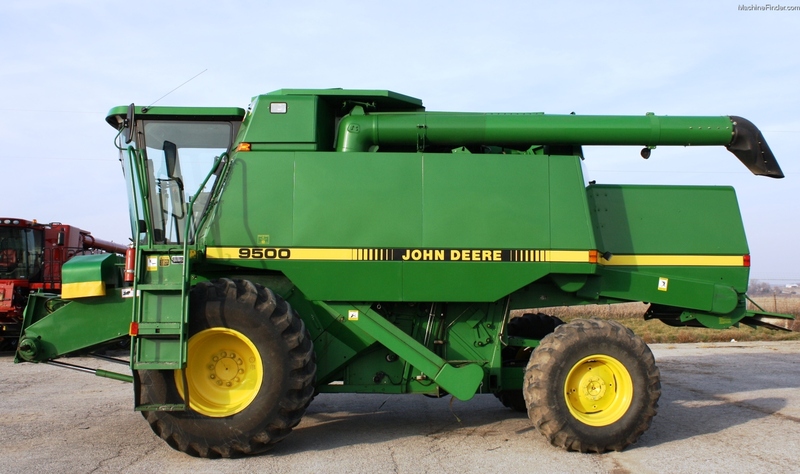 We thought it would be interesting to take a trip down memory lane, and explore the key model changes that were made to John Deere 9000 series combines, which have led us to current combines on the market. Let’s take a look at the complete transformation that took place from 1990 to 2005. During this short span of time, the John Deere 9000 series combines’ horsepower increased dramatically across all models, with the 9400 increasing horsepower from 155 to 185 and the 9600 increasing from 200 to 260. In 1990, the machine’s grain tank loading auger flighting was strengthened and the chaff spread was made available. After which, in 1991, all models were improved with increased cooling capacity and drive torque of the feeder house slip clutch. A breather was added to the Posi-Torque cylinder drive along with a new fuel tank and filler cap to progress sealing ability. In 1992, New Generation Engines were introduced in the 9500 and 9600 models, while automatic speed control for corn heads and row crop heads were made available for all models. The series feeder house pivoting was then improved and the HarvesTrak was made a standard feature in 1993. From 1994 to 1997, many design and technological features were added to the John Deere 9000 series combines to help farmers reach higher production and better collect data on the field. In 1994, hoses were implemented to replace previously used steel lines from the hydrostatic pump to the motor. A pressure fan was also added to the cab air system, and a grain curtain was also included in the design. Later, in 1995, hydraulic adjustable deck plates were made available for the 90 series corn head, while rubber belted tracks were also initiated across all models. 1996 was a meaningful year for John Deere, as the 4435 combine was discontinued, marking its last model. However, the 9000 series walker bearings lube interval was increased from 50 to 200 hours. Perforated cylinder filler plates and seat belts were also added to all machines. When GreenStar was offered as an option for factory install, in 1997, farmers had what they needed to increase productivity, efficiency and profitability. Two new choppers were also made available, one fine cut and one fine cut widespread. In 1998, an enhanced cleaning system was added to all John Deere 9000 series combines, along with a dual display tachometer and full body side shielding. The air flow feeder house system was also made available across all models. But, the most noteworthy feature would have to be the innovative PowerTech engines, providing increased power for all of these state of the art machines. In 1999, the John Deere factory installed spare knife and storage brackets on all of the 9000 series cutting platforms. During this time, the 50 series combines hit the market featuring many new enhancements. 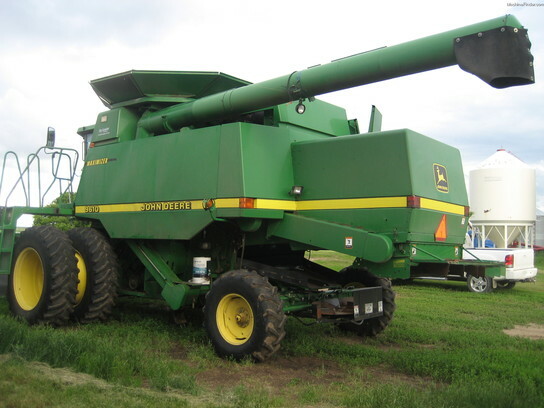 1999 was a very significant year for John Deere, as it marked the last year the 9000 series combine was made. The company continued on its mission to provide top-notch equipment as the STS (Single Tine Separation) had been in production for more than 10 years prior to it’s launch. Hopefully this has provided you with a special look into the evolution of John Deere 9000 series combines and a better perspective on how we have come to today’s combine technology. Feel free to comment with any key changes you think should have been included. If you enjoyed this post or want to read others, feel free to connect with us on Facebook or Google+ or check out more videos on our YouTube channel!